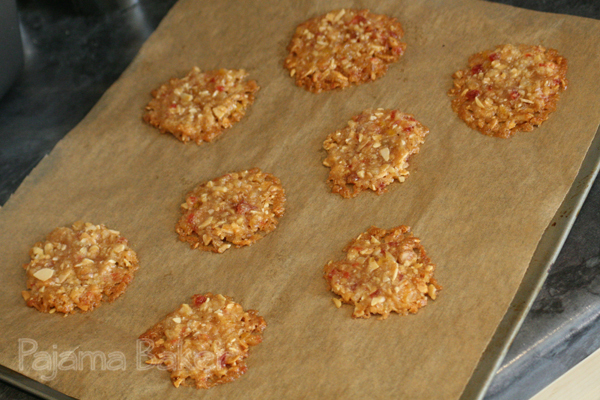 This week was biscuit week on Great British Bake Off and the technical challenge that the bakers had to complete were Mary Berry’s florentines. Now, to help clarify, in the UK, biscuits aren’t simply synonymous with cookies. 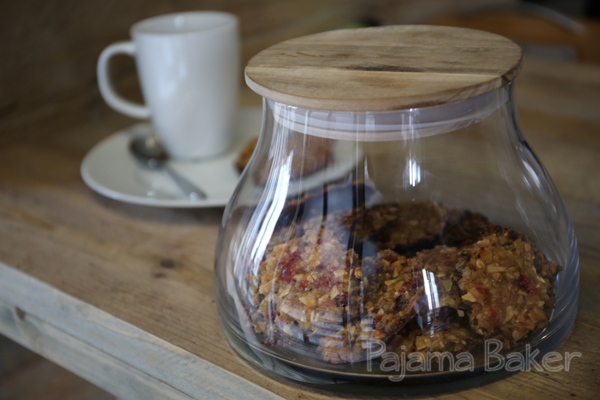 Biscuits tend to be a bit crispy or crunchy, whereas a cookie tends to be softer and chewier, especially in the center. It gets extra confusing when they make savory biscuits (with cheese and stuff in them), because in my head, those are crackers. 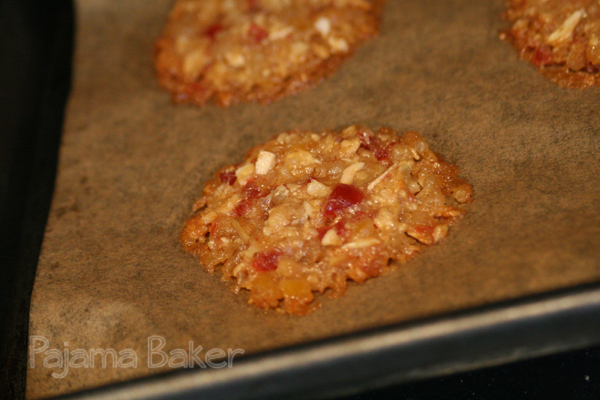 Cookies are sweet and they certainly don’t have cheese in them! Oh well, another one of those epicurean curiosities of living in another country. 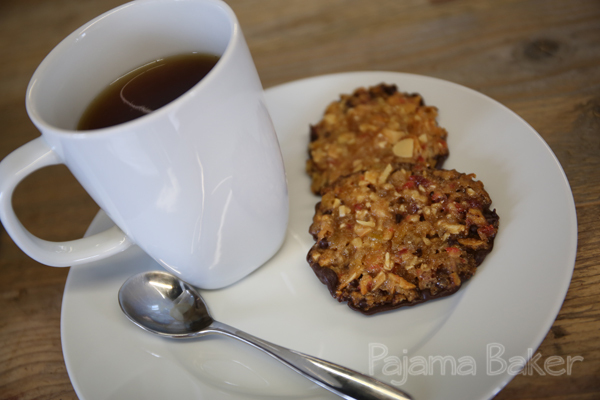 I decided to continue in my theme this season and follow along with all of the technical challenges, so I looked up Mary’s recipe that was used for the show to give these nutty, fruity, crunchy biscuits a go. They were a bit trickier than last week’s cherry cake, but that’s because you have to be very precise when measuring them out so that they’re all equal. And even then, a couple of mine spread unevenly. 1. First, preheat your oven to 350° F (175°C). Line a few baking trays with baking paper, and set aside. 2. In a small pan over low heat, add the butter, sugar, and golden syrup. Heat gently until the butter melts. Once melted, remove the pan from the heat and add in the rest of your ingredients (except the chocolate!). It’ll form into a sticky, gooey mixture. 3. Now this is where it gets a bit tricky. You need to divide the dough into 18 biscuits. In theory, you could just add up all the weights and divide by 18 (so 18 grams each), but nope! Because the mixture is so sticky, you’re bound to lose a bit of weight to bits getting stuck to your hands or spoon or everything. So I measured mine out to be between 15 and 16 grams each to be sure I had that covered. Place each of your 18 dough balls evenly across your prepared baking sheets, making sure there’s plenty of room for them to spread. 4. 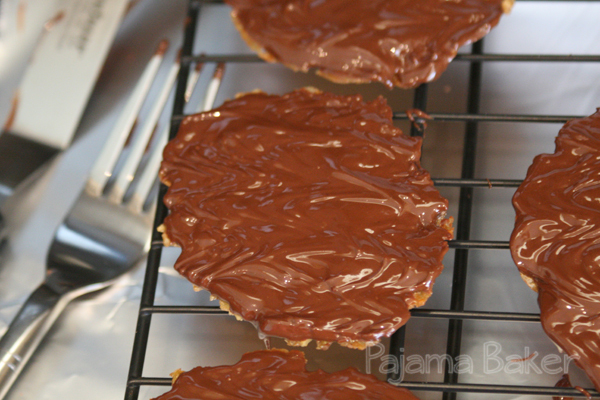 Bake for 8-10 minutes, until they turn a dark, golden brown around the edges. Remove them from the oven to cool, then carefully move them to a wire rack for the next stage. To quote Mary, the should have a “nice lacy texture” to them, with the edges uneven and you should be able to see through them a bit. 5. Temper your chocolate by heating half of it in a heatproof bowl over a pan of water on medium heat. Once it’s melted, remove the bowl from the heat and add in the rest of the chocolate. This should make your chocolate nice and shiny when it sets. 6. Using a palette knife, or offset spatula, gently coat the underside of your biscuit with the chocolate, and then place it upside down on a wire rack to set. Once the chocolate begins to set up, drag a fork back and forth through the chocolate to create the “signature zig zag” look. Then allow the chocolate to cool and set completely.